The "Great Wolf Lodge" confirmed plans to build a 350-room hotel and 85,000-square-foot indoor water park in Scottsdale. It will be near Salt River Fields at Talking Stick and is expected to open in 2019. SALT RIVER PIMA-MARICOPA INDIAN COMM., AZ — Great Wolf Lodge will open its first resort hotel and indoor water park in Arizona in the fall. The resort announced Thursday that it will welcome its first guests on Oct. 17, 2019. When it opens, the resort will have 350 rooms, an 85,000-square-foot indoor water park with body slides, tube slides and raft rides; an outdoor resort pool; and the Great Wolf Adventure Park, a 27,000-square-foot entertainment center with a multi-level ropes course, rock climbing wall, miniature golf, bowling, and an arcade. More information on the water park attractions would be announced in April, a news release said. The resort is being built across from Salt River Fields at Talking Stick near the Loop 101 and Talking Stick Way within the Salt River's Talking Stick Entertainment District. 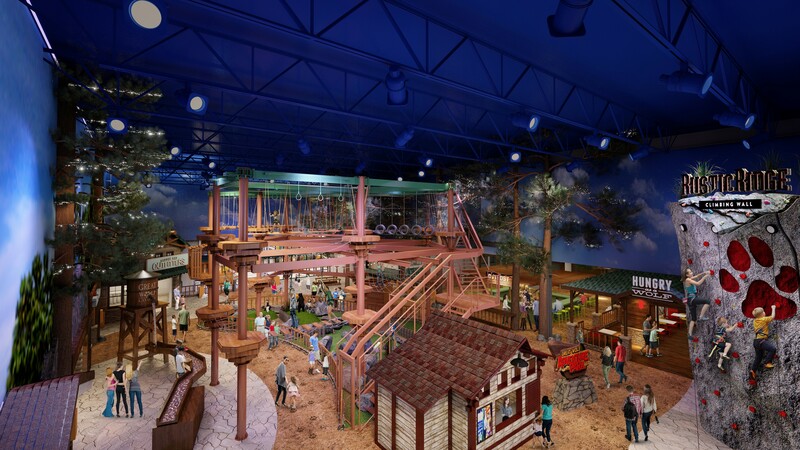 “Great Wolf Lodge Arizona will provide families in the Southwest with a unique and fun-filled resort experience both in and out of the water park,” said Mark Rucker, regional vice president of operations for Great Wolf Resorts’ western region, in a statement. “Our Scottsdale location will offer a place where joy is found around every corner and memories are waiting to be created – no matter the desert weather." A "standard" room will start at $199.99 per night and include two days at the water park, a news release said. Reservations can be made online at GreatWolf.com or over the phone, 1-888-960-9653. The resort is offering a grand opening promotion: those who book rooms before May 1, 2019 for vacations between October 17, 2019 and December 20, 2019, can save up to 30-percent on standard rooms. Use code "GRAND". Up the road, Medieval Times is building an 80,000-square-foot castle -- its first location in the state -- to house its dinner theater and jousting tournaments. View behind-the-scenes photos of the construction site. Medieval Times says it expects to open this summer. White Castle announced last year that it would build a restaurant at The Block at Pima Center, a development near the Loop 101 and Via de Ventura. Construction is scheduled to start in April with the opening planned for "early fall," a spokesperson said. In Gilbert, a 25-acre water park, called The Strand @ Gilbert , is slated to open in summer 2020. It will have cable-based activities, such as wake boarding, skiing and knee boarding.